HOW DANGEROUS IS DARK MONEY? : Tommy Vietor discusses money in politics with "Dark Money" author Jane Meyer. Pod Save the People - THE RACE TO ZERO: DeRay McKesson (along with regulars Clint Smith III and Brittany Packett) talk the racial wealth gape with law professor law professor Mehrsa Baradaran and OMB David Kamin discusses the latest tax bills. With Friends Like These - WHAT ABOUT BILL? : Host Ana Marie Cox discusses the Clintons with NY Mag writer Rebecca Traister. Lovett or Leave It - TAKE A KNEE, TOYOTA! : Jon Lovett talks the year since the election with Ronan Farrow, Katy Tur, Alex Wagner, and Michelle Wolf. Pod Save the World - TRUMP’S ADVENTURES IN ASIA: Tommy Vietor and career diplomet Danny Russell discuss Trump's recent trip to asia. Crooked Media also mentioned they have three more pods in the works including Majority 54 with Jason Kander, "Keep It" hosted by Ira Madison, and "Girls Just Wanna Have Pod" with Erin Ryan. No word yet on when Pundit and Leo's pod will drop. I am so pleased that the core team seems to have gotten the message about being less white and male and self-congratulatory. Lovett's guests started out with obvious tokenism, but now the panels seem much better. In the same vein, I like that Tommy's been bringing in some Republicans so they can disagree, but without any histrionics. I think I'm going to take a pass on Majority54. I don't know any Trump voters (that I'm aware of) and I don't want to know any. Which probably makes me some kind of bothsideswharrgarbl so much for the tolerant left etc but... whatever. I love my bubble. I most reliably listen to Lovett or Leave It and Pod Save the People - I'm with you on the panel show thing, and I really like the accessibility of DeRay's interviews and the fact that the news roundup on his show often has items that are actually news to me and broaden my understanding. My job lets me listen to music (or pods) so I listen to all of them. 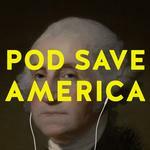 Pod Save America I will always like just because they encourage activism rather than just discussing politics and I think that makes them stand out from the crowd of other liberal/left political pods. Pod Save the People is the most in-depth, I feel. And of course it also places an emphasis on activism and probably is the most left-wing of the pods. Lovett or Leave It is the easiest listen as it's mostly a comedy show about politics. Tbh, I get a little annoyed that Pod Save the World has so many Republicans (at least imo) as I want them quarantined to With Friends Like These. But given that he does a lot of foreign policy stuff, if he wants people from previous admins they're going to either be Dems or Republicans. I love Jason Kander so I will definitely check out his show but god I hope it's not all Trump voters. JFC I am so tired of hearing about them. No word yet on when Pundit and Leo's pod will drop. Maybe they were just waiting for Lucca to get here? I'm planning to check out Majority54 because of Kander. If it's too focused on white working class voters, I am giving it a pass. My podcast card is full, and I will still want to give Keep It a try because I love Ira Madison. I listen to Lovett, Pod Save America, and Pod Save the World. I've been giving Crooked Conversations a whirl, but they haven't really said anything that was new information to me in three or so of them, and I think it may get dropped to the bottom of the pod-heap shortly. DeRay unfortunately tends to spend more time on ELI5 level summaries than I have the patience for, and a lot of the history was just too depressing for me to halfway listen to while working. Friends annoyed me too much, so I'm planning on just skipping Majority. Like soren, I don't have Republican friends at this point, and it just seems like it'd raise my blood pressure. I also gave Friends a shot but decided I didn’t need the anger. Otherwise I stick with Pod Save and Lovett as my general go-tos. I actually frequently just listen to ththe commentary on Pod Save and skip the interviews and then come back when they talk to DeRay or someone else on the network. Lovett can sometimes get a panel that doesn’t work, or sometimes a commedian who is talkative but out of step with everybody else, but that’s one of the risks of a panel show and usually it goes ok and sometimes is hilariously good. I, too, am on Team LoL and PSA. I'm more likely to skip a Thursday PSA than a Monday one, as Tommy and Jon are more enjoyable than Dan. I didn't catch on with PStW or Friends, although I'll check them out every now and then. This week's Friends is worth listening to, although the transitions are horrible -- commercial breaks appear out of nowhere.